A support group is a gathering of people who come together around a common concern or interest. A support group can help persons cope better and feel less isolated as they make connections with others facing similar challenges. A support group is different from group therapy. Support groups in faith communities may be formed by clergy or lay persons such as family members and consumers. Support groups come in a variety of formats. Some groups are educational and structured. Other groups emphasize emotional support and shared experiences. Regardless of format, members of a support group typically share their personal experiences and offer one another emotional comfort and moral support. They may also offer practical advice and tips to help persons cope with their situation. This section of the website offers guidelines for starting a support and some examples of what different support groups are doing and how they are structured. We encourage you to write a short description of a faith based support group you may know of or be involved with. Your stories can be sent to Susan at . This document is based on the pioneering work done by the First Congregational Church, United Church of Christ, Boulder, Colorado. 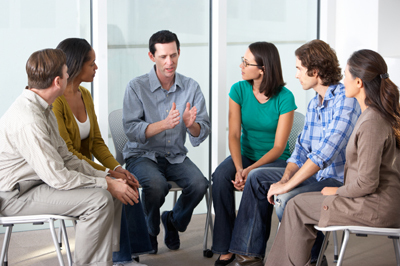 A Spiritual Support Group for Mental Health and Wellness is a loving, supportive and confidential meeting place, held regularly and sponsored by a faith community where those challenged with mental illness – and/or their family members and friends – can share and hear how faith and reliance on a Higher Power can be helpful when coping with this disease. 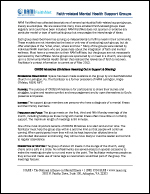 Published by INMI (Interfaith Network on Mental Illness). 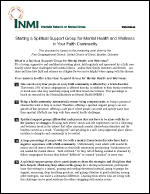 NAMI FaithNet has collected descriptions of several spirituality/faith-related support groups, merely as examples. Each group described here has sprung up independently to fulfill a need in their community. These models are not intended as the best or only way of conducting such groups, but do offer examples of the “what, when, where and how.” Many of the groups were started by individual NAMI members who are passionate about the integration of faith and mental wellness. Most have a connection to their NAMI affiliate, but the groups are not necessarily sponsored by their affiliate. Some groups are sponsored by or meet in a church; one sprung up in a Community Mental Health Center that realized the relevance of faith to recovery. Facilitator’s contact information is current as of May 2013. Safe Harbor was launched in May 2014. Each support group is led by individuals with personal or family experience with mental illness and are active in their Christian faith. Meetings include a devotion, prayer, sharing, and education, offering encouragement and hope to participants. 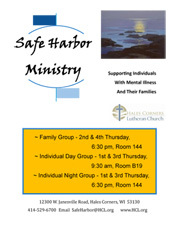 Safe Harbor offers two support groups for individuals who experience depression, anxiety, panic attacks and other forms of mental illness. On Sunday evenings at 5:15 PM you can find a faith based group of those with a mental illness and their loved ones sharing their experiences with one another. My wife and I, Chris and Wendy Janvier, in February of 2014, approached our church, The Hills Church of Christ, with the idea that a support group for those with a mental illness and their loved ones was needed that promoted HOPE through faith. The staff agreed and the process of starting H.O.M.E. began.